Where should I place the subwoofer? I ordered my VTF-3 MK2 yesterday (Friday) and sent room sizes to HSU today. I would really like to put the sub in the center under the screen. (that might be the recommended placement but I doubt it) What am I going to give up by doing that? This will be my first real subwoofer. PS I was counting on the 3-4 week back order time as we go on vacation tommorow. I had to call Fed-Ex and hold the package because it shipped that day. Well, placing it in the center of the room is not always bad. It depends on your room dimensions, really. If your room is very small, it might not matter that much. For larger rooms, there tends to be an strong acoustic “bass void” in the center of the wall at many frequencies. We know that many of our customers place the subwoofer where they like, even if we recommend otherwise. Usually there is no real harm done. However, we know that the room itself is extremely critical to achieve powerful, accurate sound. The room is often called the final speaker, component, etc. to bring home the point that the room setup makes much more difference than most speaker cable or other tweaks. That is why we personally pay attention to subwoofer placement. Feel free to ask other placement questions in this thread. Thanks. I have had a VTF-3R (now with the new 350W amp) for six months now and I keep moving it around! Throw all theory out the window. I know it's heavy, but as I moved it around and took SPL readings at different sub frequencies, I discovered a location that was relatively flat across the seating area from 20-60 Hz. no peaks or troughs. It is to the left side of the RPTV and 4 feet away from the corner. I also moved my sofa a little closer to the monitor to take advantage of the bass from the sub and from my Dynaudios in this position. This is about the sixth location! My conclusion is this: Use an SPL meter, compensate for the sound meter's sensitivities to bass, check multiple locations at multiple bass frequencies and then listen to music and movies. You might find the best spot is where you least expect it! Good luck. P.S. A white paper from Harmon-Kardon even suggests the two subs, placed at the middle of opposing walls gave the smoothest response across all bass frequencies in a typical room. Their conclusion was that no advance computer simulations or theoretical pondering gave them the response they found. It was alot of trial and error. Last edited by tgrisham : June 13th, 2004 at 7:31 AM. Reason: Additional info. I have had a VTF-3R (now with the new 350W amp) for six months now and I keep moving it around! Throw all theory out the window. Somewhere I read that if you put the sub at the listening area and move around to find the point where the sound is loudest, that's where the sub should go. I did that and found that the sound was loudest in the corner of the foyer by the front door. Big surprise. That's where I've had the sub located. I plan to put a parametric equalizer in the path to level out any bumps. Also, I plan to run spectrum and distortion plots using a calibrated microphone as soon as my amp comes back from repair. I agree, with room acoustics the proof is in the pudding. It often takes trial and error to get the response that sounds best to you. Any experimentation will put you well ahead of most, who simply put it in the one place they decided upon and left it there. I wouldn't throw out all theory, as there is nothing more practical than good theory. Sometimes, a few "rules of thumb" can save some time, although I'm sorry it didn't help in your case. Of all of the subwoofers that I have owned, room acoustic variations can be the single most important and telling variable. Getting the best position requires a whole lot of patience, and is very time consuming. But regardless, getting that position is "important", even if you are going to be using a parametric (you can turn a sows ear into a silk purse). The acoustic problem with most rooms is why eq'ing subwoofers (for your main listening position) is growing in popularity. With so many filters available in the BFD1124 and the DEQ2496 for such little money they can be a great addition to your final sound balance. Hello, I'm about to set up a brand new Hsu VTF-3 in a friend's home theater. His couch will sit approximately 20'-25' from his 61" TV. If memory serves, when I set up my own VTF-2 severl years ago, Hsu Research recommends setting up the sub in the corner behind the listening position. We can do this, but it would require running a subwoofer interconnect through the crawl space beneath the house. The interconnect would have to be somewhere between 30'-50' long, and the subwoofer would be fully 25'-30' from the TV. Would you still recommend this placement even when we're dealing with distances this long? If so, do you know where I can find a quality interconnect that's 50' long? Relevant info: We plan to hook up the sub via low-level input. We'll test the subwoofer in multiple locations with an SPL meter and test CD, and if room modes are a problem, we'll incorporate a digital parametric equalizer. I just don't want to bother with testing the behind the couch solution if those distances are going to be a problem for RF interference or time delay problems or something else I haven't thought of. Time delay won't be a problem as you can set that up through the reciever. I have an inexpensive 25' cable and don't have any problems. If you are going 50', then you might want something of decent quality, but no need to break the bank. Parts express sells some nice cables (or you could make your own). HSU also sells a very nice interconnect, but it is not long enough. You could probably connect 2 of them though - see what Sasha reccomends in that regard. "Yes, I would still recommend placing the subwoofer behind the listener. Best if placed directly behind the sweet spot on the sofa, with the side of the sub parallel to the back of the sofa, 1" or so from the sofa. If that is not spouse acceptable, use it as an end table on wall A side of the sofa. Crossover at 80 Hz. If the receiver allows you to set distances for the speakers, set the distance appropriately for the sub. That should compensate for the distance differences. "You can run RG-6 cable under the building. We do not believe that cables make a big difference as long as its well shielded." Well let me get this out of the way right off the bat. Mine is in the front corner of my room. Hower, I did just get a new reciever with plenty of wazooo features and I am sure I will spend hours, days, weeks, months, (you get the picture) of playing with the settings and moving around my beast. That is why I purchased the longest sub cable I could afford. Something that did come to mind while looking through this thread, has anyone ever used the ASC bass trap with this sub? It would seem odd to lift the sub another 18 to 22 inches off the ground. For those who are wondering what position is best for you, all I can say is keep experimenting. I was very happy where I had my sub, which was in the front corner of my listening/theater room. After reading so much about placing the sub behind the couch, I tried moving my sub around. Currently I have the sub next to my listening seat, moving it around slighty, back in forth. But it sounds great. Not the solid fat punch I had from the front corner, but a smoother deeper sound. Also, the bass just seems to sneak up on me. It sounds great but I do have to say it sounds different, so keep experimenting. I am considering the placement of 2 VTF-3R units towards the opposing back corners of a very unusually shaped listening room. Actually, one is in almost a corner of a bay window (left-rear) and the other about 8 feet from the right rear - I should mention that this is a much-wider-than-longer room. Now here is the dilemma - the left rear position is planned to be close to a window - do I need to be concerned about rattling? And the right rear position will be about 5-6 feet from a grand piano. I have concerns about both strings vibrating (yes, they are normally "damped") as well as the soundboard resonating. Does anyone have any experience with taming resonances with either a piano or a window? Any other unusual placement experiences that offer valuable lessons in room design/placement for the rest of us? I too tried moving my VTF-3 mk2 all around. First I tried the front corner by the bookshelves to left of the monitor. It sounded good there but I wasn't quite satisfied. So then I tried moving it inbetween two recliners in the center of the room. It sounded better, however for the two sitting in the recliners it could be kind of scary-a real rumble seat. I could handle it but the WAF came into play and she really did not go for the end table concept I was trying to sell. So finally I moved the beast to a back corner behind the seating area to the left, this is where it has remained. It has more volume there and all my measurements taken from all seats in the listening area were more balanced. When tuned correctly and not too "hot" you can't tell where it is as it blends seamlessly with the Paradigms. Sometimes though, for demonstration purposes only, I like to crank it up. I am fom the old school of Boomy car stereos from back in the 80s and to my ear I just prefer the bass to be behind me. I hope this helps. I have a 7 foot grand in the same room as my VTF-3R Mark II and I hear no sympathetic vibrations in the strings. The piano is about 15 feet away, but since I can detect resonances and vibrations in distant parts of the house from the sub, if the strings were affected, I would hear it. I can hear rattling of the dishes on another floor in the kitchen! Good luck. Hsu always responds to customers questions regarding dimensions. With a room so large, 17X24 calls for the services of a VTF-3 MK2. Why did you go with another VTF-2?? For such a large room a VTF-3 should be the only choice. I believe the more proper response is this: The VTF-2 may or may not be adequate for that sized room. It will depend on the type of music and movies you like and the sound pressure level you want to attain. The best option is to use the sub you now have and optimize its position. The position you mention probably won't optimize the loudness since most subs are very dependent upon using the room for low frequency reinforcement. I prefer my sub in the front corner and I hardly have it turned up. Putting the sub in the middle of the front wall will deprive you of some of the subs potential loudness. If you cannot "pressurize" the room to your satisfaction, send it back and get the VTF-3. Hsu may even work out a deal to help defray the cost of shipping if you are buying the next one up. However, it may be more than enough for you, and if so, you got a great deal on a great sub. Enjoy! I have a general question about sub placement. I get conflicting opinions on subplacement. I've read in this forum that placing the sub behind the listeners position may turn out to be the best place. When reviewing other subs, I read that the front of the room is optimal. I have a room that is 14.5' wide x 18.5' long x 7' high (with a drop ceiling). Due to a corner fireplace in one corner and a closet in another, I have limited space in the front half of the room. I could have a hole cut into the closet and have the sub fire towards the listener but would rather not. My only other options would be behind the couch (in the middle of the wall or near the corner) or behind a chair adjacent to the wall (but closer to the middle of the adjacent wall). If I have a hole cut, I need to do it now as I'm having the room built soon. Any opions would be greatly appreciated. Behind the couch is fine. If you use an 80 hz crossover the sub is non directional. A lot of the HTIBs reccomend the sub in front because they crossover fairly high (150-200 hz) and the sub can be located at those frequencies. Well this is one year later from my first question that started this thread. I ended up placing it in the corner recommended. I put it on the riser in the middle and crawled around the room. Now I want to know where people have placed a second sub? I will send Dr. Hsu my room sizes again to get a recommendation. I hear things in movies I never heard without a quality sub. (ie Darla tapping this glass in Nemo) I really don't know why I'm getting a second one I don't percieve any weaknesses other than I want it and the wife says it's my choice for a fathers day present. Christmas will be new speakers. If the listening position couch is in the center of the room and i wanted to place the vf3 next to the couch, which way should the port be facing to the front toward the tv, or the the back of the couch? Most people would be inclined to position the subwoofer so that the ports fire to the rear. This tends to look most aesthetically pleasing when viewing the subwoofer from the front of the room. In your case, since the subwoofer may be relatively far from both front and rear wall, sound quality should not significantly change one way or another. Go with the orientation that you feel looks the nicest. Well, with the below link being my HT, where should I put the first HO and later this year, where would you suggest placing the second? Keep in mind that the couch on the right will not be there, and the blue theater seats (only the one on the left is visible, right one is directly below the camera) will be 4 instead of the now present two, and arranged in an arc. Where to put the new HO? http://www.hsuresearch.com/forum/att...ntid=424&stc=1How about from this view? What a beautiful room you appear to have! I suggest that you put the first VTF-3 HO in the front left corner, and then put the second VTF-3 HO in the front right corner. You will only need two or three inches of space between the subwoofers and the side walls. I've only ever had my one Sony HTiB POS sub, so I'm kind of new to this, but are they meant to be square with the wall like that or do you angle them? That said, If you do end up creating a left-firing version, would I put that in the left corner, and move the pre-ordered right-firing HO to the right corner? Hey, I just caught this, but the HOs haven't even been released yet and yet you have two of them!! What gives? If we start to offer HO versions which fire to the other side, then by all means experiment with driver orientation. It will probably not make a big difference firing one way or another though, but it will certainly not hurt to experiment. That picture was taken earlier this month at our booth during 2006 CES in Las Vegas. No one actually has the production-ready VTF-3 HO in their home yet. In fact, those two subs in the picture are the only production-ready samples that we have at the moment! Unfortunately I am not sure if I will be able to fit a VTF-3 HO into my home, so I will have to wait for VTF-2 HO! 1) where should I place the TV along the media room/equipment cabinet wall (it is roughly 61 in wide by 37 in high)? 2) where should I place the in-room fronts and the other five wall-mount speakers? 3) where should I place the sub? I recommend that you place the TV centered along the wall where you have shown it in the picture, if possible. This way, you will have a reasonably good viewing angle for as many individuals as possible. Try placing the subwoofer in the front left corner (meaning, the front left corner from your seated position on the couch while facing the television). I recently purchased an VTF-2MkIII. For convenience of hookup, I originally placed it behind/left of the main listening location. My wife didn't like it there as it was the first thing you saw as you entered the front door and looked up the steps -- she calls it a "white" elephant (maple finish). I ended up putting it in the right front corner of the main listening area with a GRAMMA isolation pad under it (we have wood floors). After some tuning it sounds great in the main listening area but even better in the sunroom off to the left. Since I don't really get off on the stereo seperation aspect of the experience I enjoy listening, from what some people would say, is a non-optimal location. I have the sub cabled directly to the amp speaker outs and then over to the main speakers. I originally had the sub connected to the amp pre-out 2 but did not want to run an interconnect under the floor -- rather I leveraged the existing speake cabling -- works fine and the amp (NAD C372) drives everything fine with minimal effort. Until I got this sub I never knew what I was missing -- even though I have a seperate Home Theater in the basement with a 5.1 Bouston Acoustics setup. Nice work HSU Research! I highly recommend this product. I just purchased a VTF-3 MKII. It is an open concept house, not too many walls. The sub is in a room with very high ceilings. The best place I can come up is by the couch. The port is facing back to the wall, about 1/2 feet to a feet. However, behind the sub, around the same height of the port, we have a window. So part of the port is supported by the wall, another part by the window. In your opinion, will this cause a problem, the situation with the window? castaban, it shouldn't cause a huge problem, as long as you don't hear too many offensive rattling noises. Also, you can try turning the subwoofer sideways behind the couch so that the ports fire to the side. Peter, this is my setup. Hope this helps. Thank you very much Nick, that was helpful! I would place the subwoofer in the rear corner that is in between the two couches. If budget is really tight, go for the VTF-2 Mk3. You can always add a second one at some point in the future, and/or run it in maximum output mode (both ports open) for highest output capability. Otherwise, a VTF-3 Mk3 would be great too. That is actually where I have my sub right now. The VTF-3 MK3 is at the upper end of the budget but will not be a problem. Because of the limited space, where should it fire into? Thanks for the help. It shouldn't matter too much how the sub is oriented. Feel free to play around a little bit and see if you prefer any particular orientation. The important thing to remember is that the driver needs at least 1-2" of space between the woofer and any surface it is firing into, and the ports need at least 3-4" of space between the port and any surface they fire towards. I just put in my order for the VTF-3 HO w/Turbo, my living room is odd-shaped and I'd really be grateful for any advice you may have about positioning of the sub in the room. Granted, I'll have to experiment a bit, but a little advice may save me some time! Hmm...I hope I didn't pick too big of a woofer (did I?). So many rave reviews about this product, I wanted to give it a try! Paradigm Studio 40's, surrounds and center. You have big open areas like I do. I have the 3.3 Turbo and found that taking the turbo off you get much better output from the 3.3. The bass is more dynamic. Anyway, the sub will probably be better in the far right corner of the TV. I remember reading your post, thanks for the insight! I had a hunch that was the case with the turbo. I like the option of using it though My POS sub seemed to have problems with the corner, not as accurate it seemed. I'll be curious to see how this one sounds given my room. Is your crossover set to 80Hz? Crossover is set at 80 Hz. Also looking for placement sub purchase suggestion. Also looking for sub size and placement suggestion. I've included a rough drawing of my room. I am planning to place 46" LCD TV in a corner surrounded by L, R bookshelfs (Ascend Sierras). I will mainly use for HT, but also for music. I don't want to place the sub near TV because concerned I will damage it. I was looking at putting sub in a corner (#1 in diagram). Dr. Hsu suggested placing right next to viewing location but I think this is not easy from wiring standponit (except maybe #4 in diagram). 1. Will VTF3 Mk3 be big enough for this space if tuned for Max Output and placed where I am planning (#1 on the graph)? 2. I don't know if my Pioneer VSX-D509S gives option for setting cross-over below 100Hz . If I cross-over at 100Hz, how noticeable will the sub placement be? I will get an Onkyo HT receiver in the longer term so this is a short term issue (1-2 years). 3. If you have other suggestion how to position or what to buy want them. Buying 2 subs doesn't work for me. I am selling my floorstanders to make room for the 46" LCD so I can't see myself getting multiple subs for optimizing the placement (nearfield, etc). I have a set of VT-12s and a VTF-2 Mk2, and was wondering where would be the best place to place the sub in the great room. The room dimensions are 15' x 22'8" and there's a 1/2 wall and bar area that's open to the kitchen. There is going to be a large sectional in the great room which is approximated by the sectional in the image. The placement of the sectional and TV may move over to the left slightly, but the facing is correct. The entire floor is hardwood except the trapezoidal shape in front of the fireplace which is tile. 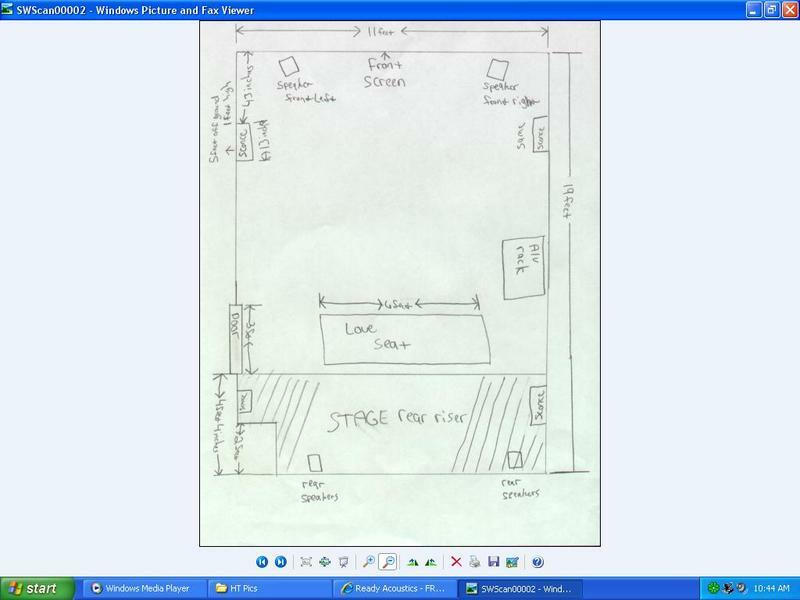 I've attached an image of the floor plan. Thanks in advance. I would put it either in the front left corner (ie. lower right hand corner of your picture), or as an endtable near the listening position. OK, In less than 24 hours I should take delivery of the 3 3. I have enclosed a CRUDE drawing of my listening area, At the moment I have chosen left front corner from my listening position. Left front corner looks good! Just make sure to give at least 2 inches of space between the woofer and any surface it fires into, and at least 3-4 inches of space between the ports and any surface they fire into. Thank you Dr. Hsu. I receive my 3 3 today in good working order. All I can say is, WOW ! So far have watched I am Legand part way and I am lost for words. Listened to some music and sounds great. I have relatives coming in tonight and the weekend, calibration will start Sunday night. A friend of mine will be placing an order soon. Thanks so much Tracy, I'm sure Dr. Hsu will be thrilled to see the positive first impressions! I really can't thank you enough for all the kind words about our product and customer service! I'm taking delivery of my first Hsu Sub today, a VTF-1. I've attached a rough diagram of my main family room. I think the best location would be in the corner closest to the wall. Do you agree - and also which way should I angle the sub ? Also, how far should it be from the wall ? Thanks in advance !! Your proposed location looks good! You shouldn't have to angle it one way or another, just make sure to give at least three inches between the rear-firing ports and any surface they fire into. Pete, I have the 3 3 Turbo and have left the sub in a corner with the driver 4 inches from one wall and the ports about 6 inches from the other wall. The ports of the Turbo are facing down the side of one wall. Is there any advantage of angling the Turbo ports out toward the open part of the room ? Sounds great as is just thought I would ask before moving the beast. That setup should be just fine. Angling the ports differently shouldn't make a big difference, since the wavelengths at those very low frequencies are very very long. I have a 1220 powered by my Carver 1.5T amp. Your amp went belly up some time ago. I am updating my system and have 3 questions. 1. How far from the side wall and front wall is ideal for this speaker. I have Martin Logan Vantage (in a 7.1 system) using a Onkyo 885P with audyssy multieq xt. My room is 12x15x8. We sit 9.5' from the front speakers. The 1220 would be placed slightly behind and the left of the left Vantage speaker. I set the xvoer usally at 40 hhz. The ML's go done to 35 Hz or so. 2. Would the 1220 pair well with your new soon to come out 1220? I could put another sub on the right. 3. In my current system would any addtional equaizatoin for the 1220 help (to get down to 20 hz). currently it is coming in at 40 hz. Last edited by jmschnur : April 29th, 2008 at 4:57 AM. I'm loving my VTF2 Mk3. Just looking for some tweaking advice. My room is 14 X 14 X 9. The entryway (no door) is in the front right corner. My couch is basically centered against the rear wall. I won't (can't) set the room up in a diagonal. I don't have any rear speakers, although I've been thinking about putting a small pair I have on hand behind the couch on the floor facing upward. I have the sub in the front left corner, 9 inches from the back wall and 6 inches from the side. I basically just dropped it there. I really don't have much space to play with. I could move the sub only about 6 inches more from the side wall unless I move the mains closer together. I could probably move the sub 2 feet more from the back wall. If we assume the front left corner is the only position available and I only have the option to move it around as described, where would the best place be? Although I know every room and every situation is different, I was hoping that given the room is square there would be some general rule of thumb I should take into consideration. My first post finally there is a reason for one LOL in regards to position of the sub and the size needed to fill out my requirements (both spatial and audible). Room dimensions – since I live in a condo I am faced with crude realities and limitations to what I can and want to get out of my system. 3300 cubic feet room with 25’9”/16’/8’ (W/L/D). Diagram of the speaker positioning is below so actual Width covering the set up is at 17’ thus only ~2200 cubic feet. Open floor plan (pic below) and windows all on one side which can’t be changed. Primary use of my system is oriented for 65% HT and 35% Audio. Listening habits - although I like my sound to be fairly loud I prefer sound clarity and fairly nice acoustics over excessive volumes (mainly due to limitation of my apartment living space). I don’t have excessive bass requirements and desires thus realistically I will not be listening at really high (reference) volumes daily. Budget – for my primary upgrades I am looking to add an appropriate subwoofer to complement my old B&W setup that would fit my current setup and limitations while keeping it under $600 or preferably less. Appearance requirements – being that I don’t have a dedicated home theater I would prefer a fairly nice cabinet to fit well in the family room and match my black B&W setup up front or even better as a coffee table next to my chair and sofa. Timeframe – preferably soon rather then later! LOL I could wait a month of needed. I have read hear a lot of good things about HSU (as well Outlaw/SVS/Ed/Epic/AV123) although never witnessed it myself so I am wondering if any of you could chime in with your opinions and/or suggestions? I already have some specific models in mind from what I read in the previews, but would like to have an impartial opinion just considering my criteria and the space limitations I am working with. As you can see above the Sub would be used for both HT and Music in relatively limited apartment location and volumes. I don't want bass that is overwhelming -- i want bass that is well-controlled, believable and accurate integrating with my speakers and with the limitations of my environment. Considering these factors would a ported or closed design be optimal as well down or side ported depending of the location? Front left corner should be a very good placement in your room. I would leave it there. The subwoofer can be put very snugly in a corner as long as you leave 3-4" of space between the rear-firing ports and back wall. Hi ML, and welcome to you too! I would recommend VTF-2 MK3 for your room and budget constraints. This unit just came back in stock. Thanks Pete for the suggestion VTF2.3 is exactly what I was planning and hoping you would suggest in the first place. My only fear was due to my apartment setting as well as layout that it might be a bit too much provoking me to try enjoying it fully resulting in compromising situation with my building manager. Any idea of the ideal placement by looking at the limitations of my layout to maximize the sound and minimize the "distortion" (noting that the curved area of my unit are all large windows)? Also the floor is cement with carpet thought and blinds are aluminum and custom thus not possible to change? Would you suggest adding to VTF something like Auralex Gramma to further maximize the acoustic isolation and would it help minimize the unpleasant transfer of vibrations to the environment? Thanks in advance for you continuing help. Front left corner (ie. lower left hand corner of your picture) looks like a good placement for the subwoofer. The Gramma pad is a perfect fit for the VTF-2 MK3, and could potentially help reduce some vibrations, so it might be worthwhile trying further down the road if you run into any issues with the -2 MK3 directly on the carpet. I just received my VTF-2 MK 3 last night. And while I haven't done any calibrating or attempted to optimize the position yet, I am already incredibly pleased with the subwoofer. As of right now, I have it where my old subwoofer was located, right beside my TV in the middle of the room. Yeah, I know, not usually the best place. Now, one of my problems is that I have a lot stuff in my living room: the couch, recliner, 4 pretty good sized DVD racks, coffee table, end table, piano and of course the 46" TV and TV stand. And all of this is packed in a room that I wouldn't describe as huge. Anyway, with all of this stuff in my living room (and not a lot of wiggle room to reorganize everything), I was considering a particular front corner. I have some worries about that placement, though. The piano is on that side of the room, and the sub would have the recliner and end table between the couch, where I usually sit. Plus, the ceiling in that part of the room is lower (we added on to the living room). Once you get out of the add-on portion, the ceiling forms a ^. Would these things be problematic in placing the sub there? I plan on taking some pictures and trying to make a diagram for further input, but if this corner isn't a great option, then my choices will already be greatly reduced. Thanks so much for the positive first impressions clck! If you can post a pic or sketch of your room, that would be helpful in helping find a good location for the sub. I have a VTF 3 MK 3. Am pretty happy with it. But I have never been able to get the position dialed in. I've attached a diagram. Basically I've been using the SMS-1 to try and plot the response in various positions. Unfortunately I just sold that so I don't currently have any way to visualize the response anymore. Basically what happens is if I put it any where in the front half of the room by the tv I have the mother of all low end reinforcement, we are talking a HUGE boost at anything under 25, so big that the SMS couldn't tame it, and a HUGE null in the 60hz region at the main seat. I tried pretty much every spot in the front area, and that null never went away, and the huge peak always stayed in various degrees. So I moved it to the back of the room. Putting it right up against the back of the couch in the middle gives kind of a wonkey response, peaks and valleys all over the place, having it fire against the back wall, is a lot smoother but there is basically a dead zone from 80-100hz(this is with the main speakers unplugged so I can look just at the sub response). What is weird is anywhere behind the couch produces a fairly large dip from about 20-25 hz, and a fairly large spike in the 30hz to 40hz region. Usually if I'd stack 3 filters or so down to -12 db on the sms I could tame it. I'm just wondering is there some spot that could smooth out the frequency response over the area of the couch? I am free to put it anywhere. Don't really use the patio doors, and they are covered with curtains. The room dimensions are listed in the jpeg, the ceiling slants from 8'ft to 10 ft up on the side with the double doors. I'd really appreciate any feedback. I realize bass traps would be a good idea, but it's not likely to happen in the near future. You don't say where you have tried the 3 3 up front and what xo you have set on the 3 3 and AVR, also are you using MO or ME on the 3 3. I would try front left corner where the ceiling is at it's lowest point, 3 3 xo out and AVR xo set to 80hz. I also have an acoustically challenged room, no external eq or room treatments. It took 2 mbms upfront with mains and 3 3 behind couch to achieve best freq response and sound. I just use the HSU CD, RS SPL and Excel to take measurements. Thanks for the reply. I have it running in max extension, c/o at 80hz. Regardless of location it seems pretty flat from 15-21 hz or so. I did try both corners on the front of the room. Unfortunately the front corner where the ceiling is at it's lowest is the absolute worst spot. That is the one with the absolutely huge peak running from about 20-40hz, and then the monster null at 50-60. The other corner isn't as bad for the peak, but there is still that huge null. What's weird is I have tried moving the couch backwards and forwards a couple of feet and I can't seem to escape that darned null. MBM/s should help the 50-60hz null. Try putting your 3 3 in the front middle of the wall if possible to see what that does. You say "having it fire against the back wall, is a lot smoother but there is basically a dead zone from 80-100hz" If your AVR is xo at 60hz or 80hz I would expect to see this. I had a bad null at 160hz (AVR xo at 120hz) and by moving out from center by 1 foot my Right main I was able to raise that null quite it bit. That was the side of the front wall that has the highest ceiling height. Sorry, thats all I can offer. If you are persitant you should be able to get close. Measure, move, measure, change xo on avr, measure, change xo on sub, measure and repeat until you find what you like. It is time consuming and at times frustrating but in the end it worked for me and did not have to buy room treatments or external eq. Having the 3 3 and 2 MBMs allowed me to more percisely make changes and see effects depending on the frequency range I had problems. I had a pretty high peak from 60-100hz, lowering the gain on the MBMs tamed that. So, will a crappy room diagram and a couple of pics be enough to help me out in placement of my 3.3? I may help some but I have been using REW for the last week and it really helps to see where your dips and peaks are at and make changes with location/placement very easy and fast. Even a rough sketch (with dimensions) will help us understand your layout and help with placement. You can also just do it in words like "X" ft x "Y" ft x "Z" ceiling height with a door in the middle of the "X" wall, etc, but a picture is usually easier. Ok. I'll put something together this week. I've got an 40x16' open room with vaulted ceilings (open to dining room) and only 1 corner next to a fireplace far left and behind the listening position. what would be the best placement for a VTF-3 MK3 Turbo? Also, would it be a bad idea to hide the subwoofer in a cabinet with mesh door? Considering custom cabinets. I'm currently doing the drywall so any help would be appreciated! If possible, I would put the subwoofer on the left hand side of your listening position (used as an endtable), or sideways directly behind the primary listening position. It's ok to use the subwoofer in a cabinet, but the best sound will probably be with the sub outside of a cabinet. Thanks for the advice Pete. I think the endtable idea may be a bit difficult to implement unless I put a jack for the subwoofer input signal into the floor (hardwood floors). Would it be esp. bad if I had the sub near the front wall, on the right side of the tv (and possibly in a cabinet)? I suppose if nearfield placement is not a viable option, then placement up front will have to do! I don't have a corner available to my VTF-1 so it's just against a side wall (actually it's only a half wall, about 3 ft tall.) Ignoring that problem, is it better to have the ports facing the wall or turned 90 degrees and firing parallel to the wall? I have one of the ports plugged and I get enough volume either way so I'm not worried about maximizing output. I just want to ensure musicality and maximize the extension as much as possible. I think I read in previous posts that it really doesn't matter as long as you give it 2-4 inches? Is that correct? I assume that means if the ports are facing the wall, then it should be 4 inches. But if the ports are firing parallel to the wall, then the unit only needs to be 2 inches from wall? Sub in cavity above floor? New VTF2-m3 just arrived! Placement will be dictated by saf, so I won't get into exactly where to place it. My question is: I have a built in entertainment center that I designed around my old Mistubishi 36" tube type tv. The tv cavity is 43"W X 36"D X 36"H. I'm putting my new 46" Sony LCD in this cavity. Of course, it's only a few inches deep, so I will have a considerable amount of space behind it. I'm almost positive I know the answer to this question already, but I wanted to see if anybody else had had any experience placing a sub in such close proximity to the tv. I'm not worried about any magnetic issues. I'm almost positive that the sub will cause mechanical damage to the tv. Am I correct? This cavity is about 20" above the floor. That's another thing I haven't really researched, is sub height above the floor and what effect it has. Part 2 is the component cavity is above the tv cavity, same width and depth and enough headroom to fit the sub in behind the components (receiver, dvd, dvr, etc.). Now my questions become physical damage to those components, almost certain dvd skipping, and again, height above the floor, which is now about 6 feet. Again, I'm pretty sure based on just my experience that these aren't really valid options, but I wanted to see if any of you guys had ever tried anything like this. Otherwise, it ends up in the corner with a doily on it. You can try it both ways, but normally the orientation of the ports doesn't make a very big difference. Try to give at least 3-4" of space in between the ports and any surface they fire into. I haven't tried using the subwoofer like this, but if you do try it in the entertainment center, make sure to put something soft underneath the spiked feet. I really don't think the subwoofer will cause any damage to the TV (bass wavelengths tend to be fairly long after all). However, there may be some extra resonance when placing the subwoofer in the entertainment center. So definitely try to experiment with the front corner location too. Thanks for the quick response. After laying awake thinking about it all night, I figured out i'm essentially creating a poorly tuned bandpass enclosure, so I'm just going to go straight to the corner. Sounds good Richard, thank you! I'm trying to figure out where I'm going to place my new sub in my room. I just purchased an HSU VTF-3 MK3 (Yay for me), so now I'm playing with the idea of where to place it. 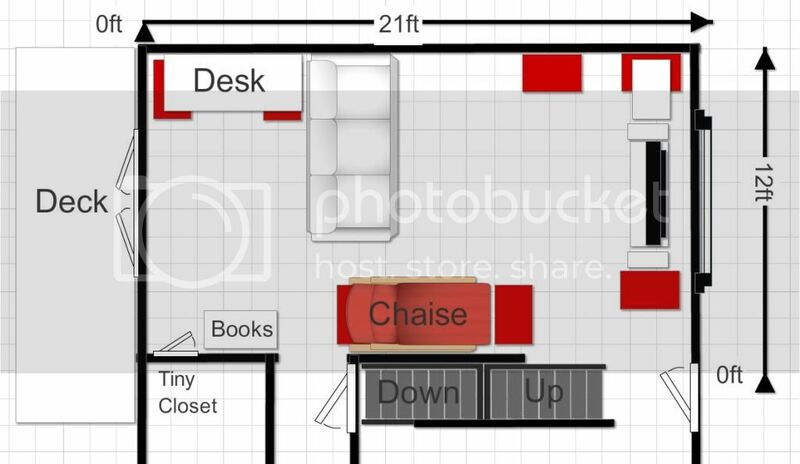 I'm attaching a picture of my room and dimensions. My floor is hardwood/bamboo, ceiling is 10 feet throughout, and the room is considered a 'Great Room' (dimensions ~ 20' x 23'). I'm considering placing the sub in one of two places: 1) in a corner behind the bend in my section couch, upper left corner of picture, or 2) in the upper right corner of the picture sharing the same wall with the TV and fronts. I know that it will ultimately come down to testing it in both areas to see what I like before committing to running the wiring through the wall. But I am soliciting opinions. I haven't received the sub yet as it should be shipping out today, but I'm leaning towards behind the couch so that the sub is 'hidden', and I want to feel the bass. I would try it in both of those locations if possible. The nearfield location will provide more mid-bass impact at the main listening position, but the farfield location may provide better deep bass and improved results across different listening positions. Note that you can always put the subwoofer close to the front left corner (as viewed from the main listening position, ie. top right hand portion of the picture) but put it next to the couch so that it is not very obtrusive. On my picture (and considering your recommendations you've already posted), my main listening position(s) would be the Green spots on the sectional couch. Would the space behind the bend in the couch (upper left corner of picture) be considered the nearfiled, and the corner in the upper right be the farfield? And by the way, my new VTF-3 MK3 is so much more than I could have ever expected, and I haven't even settled on placement, calibrated/tuned it, or unleashed it's potential. GREAT product! UPDATE: I decided to place the sub in the 'far field' placement (aka top right of my picture, in the corner perpendicular to the TV and fronts). I played around with the placement for near field vs far filed, and felt behind the couch at the bend of the sectional, the bass was too localized and overpowered the rest of the sound. Up front in the far field, the sound sounds more complete and blends smoother. Last edited by DruTheFu : February 8th, 2010 at 6:25 AM. Normally we recommend setting the VTF volume knob somewhere between 9-10 o'clock, and then adjusting the subwoofer channel level upwards or downwards in 1db increments to one's tastes. Note that the gain control on the subwoofer is very sensitive. Having the volume knob 1/4 of the way up is not indicative of the unit running at 1/4 max power, as the gain control can always be made more or less sensitive by the designer. Thanks again for all the kind words about the product! I know this is very unideal...but, the Mrs. is absolutely adament that the subwoofer is not going to be out in the living room next to a couch or behind a couch. We're building a new home, and what makes it kind of worse is the furniture will be out in the middle somewhat (so no wall to place it along, or if it goes behind the couch...it'll stick out like a sore thumb). I know its a terrible room for acoustic reasons..but we have no HT room, and we're not audiophiles either...so its what i'll have to make do with until we build another house with a dedicated HT room. My question is (and I saw someone considering this in a previous reply a few messages up), can I still get decent sound placing my STF-2 inside a cabinet in our entertainment center built-ins? I guess i'll need to place a little carpet in there for it to sit on...but do I have to worry about overheating with such little space in there (and no air flow). Also, what do you recommend the interior dimensions of the space be...so I can tell our cabinet guy? I'm assuming the front cabinet door can be solid wood, and doesn't have to be a mesh or just open? Any other recommendations (divorce is not an option, sorry!)? Thank you very much. It is acceptable to put the subwoofer in a cabinet, provided that there is an acoustically transparent opening for the sound pressure waves to radiate outward. Yes, you should put something soft underneath the subwoofer so that the spiked feet do not rest on the hard surface. Probably the most convenient way to orient the subwoofer is so that the port is facing outward (so that one can see the amplifier panel when opening the cabinet door). Try to give at least 1-3" of extra space on each side of the subwoofer. Perhaps you can use some foam pieces or pads on the sides and top of the sub to help reduce some resonance from the built-in cabinet unit. Thank you so much for the prompt reply. Could you please elaborate on what you mean by "..acoustically transparent opening for the sound pressure waves to radiate outward." You mean the front cabinet door (instead of a wood door), needs to be some type of black mesh? Such as in this entertainment center? That is correct Jeff. Basically look for a cabinet door that has a thin screen at the front so that the low frequencies can radiate out into the room. I've been a lurker on this forum since before I purchased my VTF3-MK3 over a year ago and finally decided to sign up. While I've thoroughly enjoyed the sub, I feel like I'm still missing something. I attribute this to an absolute nightmare of a room and I'm hoping someone may have some insight. I have attached a quick floor plan of my multi-purpose theater room. The sub is between the front left and center speaker - under a 120" projector screen. The mantle of the rear corner fireplace only goes half way up the wall. Room dimensions are 24' L x 12' W x 9' H. The room opens up to the entire rest of the house via the stairs in the back, preventing any kind of "seal" on the room itself. I've moved the sub up and down every wall in the room and I've tried nearfield placement. Regardless of what I've tried, there seems to be a lack of bass at the primary listening position (about 15' from the front wall). I have actual pictures if anyone thinks that would be helpful. I appreciate you taking the time to read through this post. Hi Enthused, thanks for the diagram! No doubt you have a difficult room. The big issue I see here is that the listening position is quite close to the center of the room. It is very difficult to get good bass when sitting near the center of the room, and/or placing the subwoofer near the center of the room. Another issue is that nearfield placement of the true sub is not very ideal for deep bass reproduction, while farfield placement of the true sub up front is not very ideal for mid-bass reproduction. My recommendation is to move the main listening position away from the center of the room (if possible), and add an MBM-12 MK2 placed nearfield (and/or add a second VTF subwoofer up front placed on the opposite side of the wall compared to the first VTF sub). We'd love to see some pictures too. Thanks for the reply Pete. I'm going to shuffle some furniture around and see where that takes me. I tried to avoid the center of the room but perhaps I'm still too close. An MBM addition sounds appealing - as does a second VTF3. Would the MBM be best placed between the two chairs? Would I be better off getting multiple MBMs for nearfield placement? Not sure my room can accommodate that many subs. My neighbors are going to hate me. Yes, go ahead and place the MBM in between the two chairs (assuming that they are the primary listening positions), or you can try placing the MBM sideways directly behind the two chairs. If you feel that the current setup is lacking some mid-bass punch, then this is going to help tremendously. With the MBM in between the two chairs, it can even be used as an endtable. I currently own a VTF-3 MK3 and just purchased a MBM-12. My room size is 22' X 20' X 9. I had the MK3 9 feet to the 'left/rear' of the listening position and really enjoyed the couch-shaking LFE. Now, the MBM is located in that position and the MK3 is in the 'front/right' corner of the the room, 17 feet from listening position. Is this an optimal setup for my situation, or is it possible to switch the MK3 back to a near-field position and the MBM in the front/right corner? Thank you. I would keep the MBM in the nearfield position in your setup. Feel free to experiment with the VTF sub up front or in the nearfield, but the best deep bass response will be had with the VTF sub up front in the corner. I think I'll leave the VTF up front and play around with positioning for years to come! Sounds good bread, thank you! Thank you for having this forum. I'm planning to keep the KSW15 and replace the AR subwoofer. Which subwoofer would you recommend for my purchase? Will the KSW15 work well with your subwoofer? If you need additional info, please let me know. 3. Primary uses. 55% HT, 45% Music. 4. Listening habits. I do like my volume loud, but nothing excessive. 4 Klipsch satellite surround speakers in the back at different locations. The AR subwoofer is located near the right corner off the side wall and the Klipsch subwoofer is located right below the RIGHT satellite speaker on the side wall parallel and next to the sitting area. This is my first post so I may have the quotes wrong. I am looking for my first sub. I like the MK3 due to its tabletop height about 21 in mono look replacing an end table. The ULS 15 is too short and squat 18 in height. But since the MK3 will be nearfield, - Will the ports create any kind of noise that I may hear at close listening position. My room including adjoining kitchen and hallways extend beyond 30 ft. @ 8 ft ceilings The VTF is a good height but I am looking for a clean no front grill. Any suggestions? Is the MK3 too small for my living room/kitchen and just go with the 15 in VTF and try to work it out? May I ask what are your room dimensions (HxWxD, including openings to other areas)? Where are you sitting relative to front/side/back walls and openings? The VTF-3 MK3 in the nearfield should work quite well. The only general guidelines are to give at least 2" of space between the side-firing driver and anything it fires into, and at least 3-4" of space between the rear-firing ports and anything they fire into. Where to put a couple subs??? Where do I put a couple of VTF-15's in a room like the one below..at least I hope I can get the pic to embed correctly. I have them in the ideal locations functionality wise with both of them being end tables. The dimensions should show up clearly, but the room is 14' by 18' ceiling height is a little bit under 8'. It is open to a short hallway and some stairs, so it's not sealed. The room will be treated with bass traps floor to ceiling in the three available corners and some trapping behind the fronts and TV as well as on the back and side wall in spots. I also have Anthem's ARC available to help tame some stuff electronically. So to those with far more experience than me are the proposed locations going to work well?? The dimensions of the sectional don't quite look right in the in the picture but the short side is 100" and the long side is 147" and I do have it pulled out about a foot or more from the back wall. If you need more info from me to make a recommendation please let me know. Thanks in advance for all your help. Hi breadysmith, welcome to the forum! 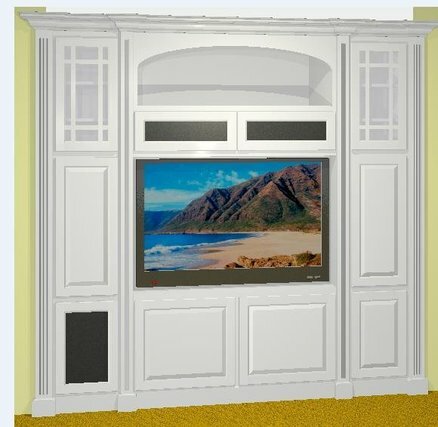 I have a VTF-3 MK3 sub and my wife wants to see if it can be hidden in my adjacent A/V closet I would open up the wall and put a mesh cloth grill in the opening to the sub. I have attached a drawing of my home theatre room and closet. The alternative is to build a speaker cabinet around the sub, but that has its own set of problems. Which of these options would work best for my situation. Thanks in advance for your recommendations. Face the woofer out into the room. Have the grille cloth in front of the subwoofer. I just purchased the VTF-2 for my HT. I've attached a drawing of the family room where it is going to be (sorry for the poor quality) and would like to get some advice about placement. I have a 65" LG tv mounted on the wall (top of picture). Under the set is a tv stand that holds my Klipsch RC-62. On each side of the tv stand I have Klipsch Bookshelf speakers RB-61. And two ceiling speakers above the couch to complete my 5.1. Have a Denon 2112 A/V receiver. The family room dimensions are 15'x25'. It opens out to the kitchen (15'x15'). The two vertical blue lines are sliding glass doors. The short blue horizontal line is a window. The two brown vertical lines are open doorways going to the living room and dining room. Currently I have the sub placed at position #1 in the corner of the family room. But from what I've read on other posts, it seems you recommend placing the sub more often behind the couch (#2), or besides it (#3). My wife thinks it would looks prohibitively out of place at position #2, and there isn't much space at position #3. I'm also guessing that the VTF-2 will likely not be big enough for the room. If I keep it in position #1, I can upgrade it to a VTF-3. But if I need to place it in position #2 or #3, I doubt that my wife will allow anything bigger than the VTF-2. Last edited by patchwrk : May 3rd, 2012 at 12:28 PM. I am going to create a false wall for my screen wall so that I can locate all of my front speakers behind my screen and use an AT screen. I would also like to locate my VTF-3 MK3 behind the wall too. It will be under the screen and I plan to have grill cloth on the false screenwall in front of the side firing woofer. Is this the best placement of the sub, woofer firing thru cloth into the room? Also, the false wall will be about 24 inches from the real wall. If the sub is turned sideways to have the woofer firing outward, it will take up about 16-18 inches of the 24 available. How far from the real wall and false wall should it be? Any other concerns with this placement? How wide is your front wall? I would place the sub so it's about 1" off the solid wall. I would place the sub so it's 1/3 way from one side (and 2/3 way from the other side wall). No concerns about that placement. My room is 15 ft wide. So 1/3 would be 5 ft from one side wall and 10 ft from the other side wall. 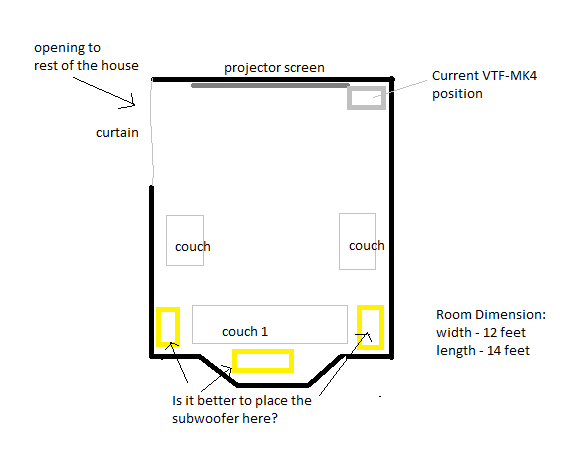 So from your response, you would have the sub 1 in from the solid wall and since the sub is 17 inches wide, that would mean that the woofer is about 6 inches from the grill cloth for the 24 in false wall space. What is the minimum distance between the woofer and the grill cloth. If I can save a few inches, I might do so. An inch should be adequate. Would you be willing to tell me if my placement of two VTF-15s is a good start or if I should be considering other locations for them? I am about to build the room shown below and already have all of the equipment. The room is 18' x 30'. The other dimentions are shown on the image. The room is 18' x 30'. The other dimensions are shown on the image. Nice drawing! Does the 8' 4" opening lead anywhere or it's just 3' deep? I assume the 3' door on the back wall leads outside the house? Bass-wise, it would be better if you can move your sofa forward as much as possible. You are sitting in the middle of the length of your room. Big null centered around 19 Hz. What other potential locations are practical for you? The 8'4" opening is to a "sun" room that is 10' x 14'. The 3' opening at the top right leads into the kitchen. The 3' opening lower right is a window into the dining room. This room is being added to the back of the home with the right side of the drawing next to the existing home and the left is pointing away from the home. So I really need to move the listening seating closer to the front speakers and video? Would 1-2 feet be enough to help? I am in a room with the same equipment today that is 11' x 14' and my seating is 11 feet from the front and I was hoping not to be closer. But if it is needed I will do what is necessary to have a good aural experience. I am making the assumption the the new VTF-15 I just ordered from you was a positive move as a pair for this room??? My listening is 50/50 movie to music. As for other locations... what about the rear two corners facing forward or? I could put them on either side of the couch but I was afraid it would be too much for the two of us sitting there. I didn't have a good image but the couch is really two oversized recliners with a 12" center between them. Actually they could be moved anywhere alog the side walls. I'd hate to spend this much and not get the most out of them. How large is the kitchen? If the back opens to a kitchen and dining room, you are not in the middle of the length of the room. Please post another sketch that includes the kitchen, dining room, and the sun room. If you can use the subs as end tables, I think that would be ideal. Would I face the subs forward or to the rear as end tables? If I added a glass top for the subs to protect them would that affect their performance? The subs should work beautifully as end tables. If its fine aesthetically to fire them backwards, I would do that. That places the woofers closer to your ears. You do not need to move your recliners forward. They are fine where they are. Putting a glass top is what I usually recommend to customers who use them as end tables. No worries about scratching the tops or spilling any liquids! Thank you so much for the quick and thorough explainations and taking the time for a newbie. I am very excited about experiencing my new room filled with a double barrel warmth of foundation in sound. You are most welcome! Enjoy them. Looking at maybe getting one more vtf-15h for my family room. The room is 14x17 and opens to kitchen then into living room. Right now I've got one vtf-15h next to my front right speaker and was looking at putting the other one next to front left speaker. I'm using a Denon 4311ci with kef q900 fronts and q600 as center speaker. Will this be over kill with two vtf-15h. I can post pictures of the room if that would help thanks. Pictures and a detailed sketch of your whole space (including the kitchen and living room) will be great. Adding a second sub will always be great - the subs work a lot less hard for the same SPL giving lower distortion, higher headroom, and better long term reliability. Here are the pictures of the family room. As you can see the family room is 14x17x8 then opens to kitchen 13x16x8 then into living room 14x19x8. I'm still working on the sketch. Looked like a second 15H in the front left symmetric spot from the current sub should be great. Well, we finished building the new room. I have placed the 2 VTF-15Hs as end tables as Dr Hsu suggested and all seems well for now. I followed the Audyssey MultiQ32 setup as suggested as well. I ended up adding two front high, two back and and my surrounds are the AIM Cinema Five Dipole speakers. As a good measure I had my 30 year old JBL L-250s reconed. I know that I have not been around a high level of surround environments and realize my hardware is not at the level of many out there spending more, but after calibrating the room, the sound is pretty darn incredible. My first burn-in experience was the DTS mastering of Alan Parsons "On Air". WOW, what an experience! Anyone wanting to own a recording that will cross the gambit of musical timbres, this is a good choice. I do have a question about the volume setting for the VTF-15Hs. As many others have commented about the Audyssey calibration, the volume knob on the subs were set at the first mark to meet the initial 75db calibrating level and the cleanest sound from these subs is pretty much there when playing music or watching movies. Have I done something wrong in the calibration or have I just bought a lot more bass/sub power than I'll ever use in the 18' x 30' room? When I try bumping the sub volume knob, the sound can get boomy and over powering. When left where calibrated, the low end is clean and very present but not in-your-face. I assume I am being educated by what I have put together? Thanks Dr Hsu for these beautiful looking and sounding monsters! Glad you liked the subs! We have a lot of gain built into the subs. You can still drive them to their limits even at the first tick on the volume control. You can never have too much sub - having more reserve also help lower distortion and increase longevity of the subs. Ok, here is my totally awesome living room sound stage Complete with sliding doors, large window and 2 openings... there is even a floating ottoman to store the kids toys i did not add to the plan. So, whats the best I can do in terms of placement of my soon to be shipped VTF15H? The more I look at it the more i think one of the desk positions will be best. How large is the space on the other side of the stairs? Post a floor plan including the space on the other side of the stairs. If the total width past the stairs is 25 - 30 ft, then I would agree with you that the desk positions will be best. Do the subwoofer crawl after you get the sub. Its only an 11.5 foot dining room and a smallish kitchen below it. Is it weird I am totally excited to put this thing on my couch and do my first sub crawl? (I can update the floor plan but i figure a sub crawl is best anyway). But just didn't have the bass I was wanting to hear. The VTF-15 was the first piece of audio equipment I purchased without listening first. The 15 is heavy and tough to move around. I put it right where the old sub was. Made a few adjustment settings the sub disappeared in the room. This is my sixth sub over 20 plus years. The HSU is the best I have ever owned. The ability to configure this sub in so many ways has to satisfy even the toughest critic. I just enjoy listening and not use technical language that is confusing. I also have to remind myself there is a sub in the room. If you really want to see how good your HSU sub is go purchase a CD by the group called Yello the CD name is Baby. The bass in this CD will destroy most subs at reference levels. Check it out, then say to yourself wow I made the right purchase. Thank you for your kind words! Welcome to the Hsu family. I have 2 VTF-15H subwoofers in my small room 14' x 13' x 8.5'. Volume at 9:00 am both, One port open, Q=.7, EQ1, 8 positions). My Denon AVR-4520 levels were -12 on both Subs after Audyssey run. AVR Levels to -7 on both subs. Can these changes damage my subs? Thanks a lot for your advices. I don't have experience on this. Bumping the channel level to -7 on the receiver should be fine. What channel levels did it set for your speakers? Bass level is already too high. The fact that your Denon sets it to -12 (the lowest it can set) means that you have too much bass already. Setting to -7 will give you yet more bass. Now, if you like a LOT of bass, that is fine. Should not be a problem for the subs. If you want a more accurate bass, try setting the subwoofer volume on both subs to 8 o'clock and re run Audyssey. Setting the subwoofer level about 3 - 5 dB higher than Audyssey is OK. Thanks Dr. Hsu for your advice. I really love my subs!!!! Hi. I just got an STF-2 and I'm having a frustrating time getting set up. I have an Outlaw Audio RR2150 receiver, HB-1 MK2 speakers and Pro-Ject Carbon turntable with an Ortofon cartridge. I'm using the low level sub out jack in the receiver. I started out using the bass management switch in the rear of the receiver and setting it to 100hz. I have the volume on the subwoofer at 12 o'clock. My living room is pretty small and cluttered (see diagram). There may be no good spot. I can't get the subwoofer to sound right. I've been using the song Nappy Dugout by Funkadelic (on vinyl) to try to configure it because that song has a fat bass line. When the bass hits the lowest note the subwoofer seems to bottom out. It sounds really flat and slightly distorted. I've tried using different bass management settings and using the subwoofer's own crossover. I've also tried moving the subwoofer around. No luck so far. Can anyone give me some advice? Thanks! Can you sketch in the details of the adjoining spaces? Not familiar with your music. Can you try using a CD source? Not sure if you are having some turntable feedback issues or not. Thanks, will post an updated diagram later today. I'll also check my turntable connection. Not so much the connection, but the possibility of acoustic feedback. Do you have flexible wood floor or concrete floor? Here is the updated diagram. The width of room is a little wider than I thought, about 12 feet not counting the alcove in the bottom right corner. I now have the sub in the upper right corner on the other side of my desk. I tried playing some music from cds as well as from my dvd player and roku. Basically the other sources generally sound pretty good, it's the turntable that's erratic. Some LPs sound great and others have that "bottoming out" problem I mentioned before. What are your thoughts on the use of subs with turntables? Some people think that they don't work so well together. I have a pretty big vinyl collection so this is an issue for me. I have wooden floors and they're extremely flexible. I live in an old rickety wood frame house. Very flexible floor means very high chance of acoustic feedback, and also if some discs are more warped, it can also cause wild woofer excursions near the tone arm/cartridge resonance. That would cause severe modulation and distortion from the sub. Does your amplifier has a rumble filter? If so, engage it. Also, try to place your turntable on the most rigid position in your room. Also, try to place your turntable on the most rigid position in your room. That would definitely be even better for acoustic feedback issues. Regarding warped LPs, a rumble filter is the only solution. Do you know what the tonearm+cartridge resonance is? (Depends on arm mass, cartridge mass and stylus compliance). The rumble filter has to roll off steeply above that frequency. Adding to my HSU stable! I have a room that is 17' square, with an opening on one side for a hallway. In the front right I have a VTF-3HO Turbo and would like to place an incoming VTF-15H in the front left corner. The HO is both turbo ports open, driver to the right wall. Any recommendations on direction of the 15H? Do I need to run it out of phase with the second one? What Q level is recommended for movies and games? The room is 3500 cubic feet and I'm looking to fill in with some solid tight bass. From what I've read I want one port on the 15h plugged, EQ1, and the crossover set at 80 for my B&W mains. Borrowed from Peaces as it's almost the same. My room is actually 17 feet across the front and back and 22 feet deep. I have a similar sized opening on the right but it starts 12 feet from the front of the room. The room is carpeted, painted drywall, a drop ceiling at 8" and there are four seats. And the right hand sub is a VTF-3Ho Turbo. How would you suggest setting up my incoming VTF-15H for mostly movies and games? The Turbo is both ports open, 80Hz crossover for B&W mains. Last edited by Backlash : August 16th, 2014 at 11:47 AM. Best if you can post your room details. Where is the opening to the hallway? left or right side? Near the back of the room or front? I would most likely aim the woofer at you, set Q to 0.3, same phase as the HO. I would like to get some advice on my subwoofer placement. I currently have my VTF-3 MK4 in the upper right corner of the room near the projector screen (as shown in the picture). Since you have advised that placing the subwoofer closer to the user is better, i would like to know which would be more optimal. I have marked in yellow where i could place the subwoofer. Or is it better to keep the subwoofer in its current position as that would be the only place in the room where it would have 10+ feet wall on both its sides. It really depends on what you're looking for. You can place the subwoofer right behind couch 1 and that may give you a stronger punch but you may get less deeper bass as a result. With that opening in the front left corner, it might help with the deep bass as well, but it's hard to say. I've been very happy with my VTF-2 MK3 for the last few years. Unfortunately (or fortunately depending how you look at it) my sub was damaged by movers in our cross country trip. So not only do I have a new house, but I have insurance footing the bill for a new sub. I've pre-ordered/ordered a VTF-3 MK5 and excited for it to ship but am working to prepare my room for optimal placement. The room itself is probably terrible in terms of it being extremely open, with a stairway and loft to the left and an open kitchen area directly behind my normal seating area. The existing sub is to the right of the couch, but next to a window. The other place my wife and I are discussing putting the new sub would be directly to the left of the entertainment center against the wall. Outside of sub placement, a thought comes up in regards to my speaker placement. I am running this in conjunction with 5 channel HSU MK2 speakers and an Onkyo TX-NR708. The center and FL/FR speakers are directly above my TV in the entertainment center on a shelf, approximately 2-3ft above ear level when I sit on the couch with the center speaker angled toward me and the L/R speakers facing straight ahead. The RL/RR speakers are wall mounted and pointed toward the listening area but are somewhat static. I suppose my question with the speakers is only concerning the FL/FR and if they should be lowered to around ear level, but placed behind the TV, rather than above it. I've attached a quick sketch showing the current layout, so any thoughts are appreciated. Looking forward to the MK5! Don't put any speakers behind the TV. It will literally block the sound, causing significant harm to your sound. Is it possible for you to angle the front left and right speakers to point to the listeners? I'm not sure how you would do this, but it would probably help if you angled them down. Another option would be to move just the front and right speakers down closer to ear level. As for the sub placement, your room is indeed difficult. Is your fireplace flu typically open? I think the placement you show is probably ok. It may work better to put it in the corner where the computer is, except that you would then need to move the computer somewhere else. Either way, it doesn't hurt to experiment if you are so inclined. Speakers as sitting now can't angle down, but I could try and see if I can get a wedge like piece of rubber for them to accomplish some angle (thinking something like this http://www.amazon.com/FloTool-11930M...0JF85AR JDTS7 ) The only other placement option would be higher up. Fireplace is natural gas with a small opening going outside, but otherwise is sealed off with a glass front. Moving the PC would be a pain, if only because all of my AV equipment is wired up through it on that side of the entertainment center. I don't have the VTF-2 anymore, so running dual subs wouldn't be in the cards, just the placement of the VTF-3 MK5. From my last setup, I always had the sub next to the couch in back, but with this room being open and reading about how the center of the room was a dead zone, that is where I started questioning things. FWIW, after everything is set up I will be using my receiver to calibrate with Audyssey. Definitely try to angle the left and right speakers down, as much as you can without making them unstable. As long as the left and right speakers still point above the listeners heads, it will likely sound better to turn them up-side down, with the woofer on top and tweeter on bottom. Other than that, your placements are probably fine. Is there room for the sub up front? I can't tell if the 10 foot wide box is your entertainment system or if you have room up there for the sub. Try to put it as close to the right-side wall as you can. Thanks - Yes there is room up front, but only on the left side. You are correct, the 10 foot wide box is our entertainment center. looking to figure out where I should place my new sub that is coming in friday! My current setup is shown below. My speakers are in blue, they are klipsch reference series. My current sub is in green, I am not extremely pleased with the location of it so far. Any recommendations? Maybe I should rearrange some furniture. Can you sketch in the details of the space on the other side of the curtain? The problem with the current placement for the sub is weak deep bass. The front wall bounce will cause a dip in the low bass. Try using the MK2 as an end table for the love seat (close to the front left corner). this is a pretty rough sketch but it should give you an idea. The hallway extends for about 20 more feet. The kitchen is pretty small. At the end of the hallway is my dining room, front door, and a stairway to my upstairs. Placing the sub in the front left area (end table for the love seat?) should be a good alternative. What is it that you don't quite like about your current placement? As you said weak sub bass. Mid frequencies dominate. The bass is still rather tactile but it is noticeable. Additionally, there is a Room antimode in the center just in front of the main couch. This isn't a large issue but it would be nice to minimize. I currently have a VTF-3 Mk2 and have the opportunity to pick up a second for a great price. Where would you suggest I place them given my layout? I'm concerned about my room size (with the dining and kitchen areas open) that the sub may not pressurize the room adequately, however I don't have the budget to add a second sub this year. Thanks for any suggestions. Was considering getting a minidsp umik-1 to use with REW, but not sure if the investment is worth it for a one-time setup, and I can't find any technical specs on if it's flat to 20Hz or not. With the 12.5 ft depth of your room, I would suggest placing the sub at the front between the front right speaker and the TV. If you don't want the sub to stick out too much, you can place it sideways so it only require 18 - 19" depth. I would face the woofer toward the TV. Placing the sub near field with only 12.5 ft depth will cause a dip in the deep bass. Great, I'll try that. Thank you very much Dr. Hsu! We purchased a vtf-3 mk5 hp about 5 months ago, and we are still having some difficulty getting it to sound exactly how we want it to. We love how it sounds for movies for the most part, but music is lacking mid-bass. Before I explain any further here is our floor plan. The ceiling is 8' tall. Round the wall lengths to the nearest foot, the program was not playing nice! The green cubes are the main speakers and the black rectangle is the vtf-3. And as you can see the room opens to an adjoining room of close to the same size, and also to a hallway. We have not been able to get the subwoofer to sound good for both movies and music. Most positions around the room we have tried have yielded recessed mid bass. The current spot it is in sounds great for Blu-Ray movies and other high quality movie content with low bass, except for a couple caveats. The subwoofer gain is turned to about 10 1/2 and the level on the receiver set to -1 db, and with these settings there is lots of port noise with any strong content lower than about 25 hz. Other settings on the sub were a Q of 0.5, EQ 1, and crossover out. The main speakers are running callibrated with Audyssey but we opted to not calibrate the subwoofer as it tended to screw with the subwoofers sound in ways we didn't like. Any suggestions on placement and settings? How far out from the wall should the subwoofer be when in a corner or along a wall? Should we move the listening position and rearrange the room? Any and all help is appreciated! The location you should is probably the worst possible place for deep bass. The fact that you have to crank it up so high and that you are hearing a lot of port noise is evidence of this. Is the opposite corner (top-left in the picture) available? I'm thinking that's likely to be best for place for both mid bass and deep bass. Another reason the mid bass may be weak is because of poor integration with the mains. One thing you can try that might yield immediate improvement is toggling of the phase switch. Another possible adjustment is the subwoofer distance, but this can be hard to set by ear. What kind of mains speakers are you using? A room measurement system can be helpful here. You can also use an SPL meter and test tones, but this is much more tedious to do and doesn't give as much insight unless you take measurements at a lot of different frequencies. Under most circumstances, Audyssey should improve the in-room sound quality from the sub, but it sometimes gets confused. It also doesn't take into account the crossover between the sub and mains at all. I'd suggest giving it another try once you have a better idea of what's going on with your mid-bass without it. That corner is available, and we have not tried that spot with audyssey turned off, so when I get home I will move it there and do some listening. In almost all spots in the room we have tried toggling the phase switch, and it has yielded no change in sound at all. The main speakers are BIC America FH-6T's, the center channel speaker being from the same series. And the surrounds are BIC PL-66's. I do have an spl meter, and I have the hsu bass test cd. Would using the third octave warble tones on the cd be worth using with the spl meter? What is the process for using the meter to measure? Does the sub need to go in the listening position? More info on what to do with the spl meter would be great! I will update you once I get a chance to move the sub! It depends on what you're trying to do. If you're trying to measure the response at a particular placement, you would set up the dBSPL Meter at your listening position, around ear height. Set your meter to C weighting and measure the output at each frequency from the 1/3 octave wide warble tones from 80 Hz to 16 Hz. Most dBSPL meters are generally less sensitive when you get to the lower bass. If you have the radio shack dBSPL meter, analog, we do have compensation numbers for that meter on page 6 in the manual. I'm in the middle of a basement finish and needing to get subwoofer placement somewhat sorted before insulation and drywall happen in four weeks. Room dimensions are 12'-9" wide, 24'-2" long. Ceiling height from the front wall to 10' back is 7'-8", then the ceiling is a foot higher to the back of the room. Main listening position will be between 9'-0" and 9'-6" from the front wall. Subs are currently drawn so that one is on the front wall and the other is just behind the couch on the left side of the room. Bar height table will be six feet behind the couch, but I'm less concerned about sound quality in that location. All perimeter walls are 2x4 in front of 8" concrete walls, so I'm a little worried about over-energizing the room. Blue circles are recessed lights, black circles are Atmos speakers. The plan is to have two subs in the room, probably VTF-2 Mk5s. I love my VTF-3 Mk5 in the living room (upstairs), but I feel like two VTF-2s will do admirably well in this space. I've considered placing both subs on the front wall at thirds along the wall, but thought I might get a more balanced sound with one right behind the couch. Thanks for any suggestions. I want to get power and wiring close now, not regret it later. EDIT: I'm at a point where I could take my VTF-3 Mk5 down into the room and do the sub crawl without drywall on the walls. Thoughts? The room opens to the left at the back? How large is the space to the left? The subs will have to energize that space as well. Due to the opening on the left, I would put the front sub closer to the left and the back sub on the right wall instead of being close to the opening. Due to the large space to the left, I would suggest a pair of VTF-3 MK5 HP instead. Being in the basement on a concrete floor, you feel the bass less than upstairs on wooden floor. Yes, the TV room is really an extension of the room to the left. The room to the left is 14' (top to bottom) by 30' (left to right), but movies/TV will be viewed where the subs are intended to be. I did consider putting the front sub one third from the left wall and putting the other sub to the other side of the room. That may actually work better with main listening position and furniture arrangements. I did edit my last post to say I could do the sub crawl with my VTF-3, but I don't have drywall up yet. I don't know if that will yield the best results, but I suspect it will still help me get the best placement later. Thank you for the suggestion regarding the use of VTF-3s versus VTF-2s on the concrete slab. With solid concrete behind the drywall, the drywall should not have much impact on the bass response. Hence it should be just fine to do the subwoofer crawl now. Bass feels much stronger when you sit on a suspended floor. You can feel the floor shaking! Sadly concrete floors don't do that. Our VTF-3 Mk5 is right next to the couch upstairs--it is unbelievable! Thank you for the continued suggestions. Keep making great subwoofers! I am building my HT and will have two VTF-MK5 subs. I want to put one behind my seating and one in front under the screen. My AV installer said that you should never do that. He said either two in front or two in back. Are there any guidelines regarding placement of two identical subs. It depends on the room and where you're seated. There are no hard and fast rules when it comes to sub placement. For example, let's say your room and your seating position is fairly symmetric and you place a sub in the front corner and another in the other front corner, then you would likely get a very similar response as just one sub in the front though you may get more output overall. Placing them equidistant like that is a safe bet in terms of keeping them in phase, however, it could actually severely restrict you in options that can actually smooth out the response more effectively. If you do try out different placements, such as one in the front and back, then one of the things that can really come in handy is a receiver with dedicated bass management for both sub outs. So that means you can adjust the distance for each sub individually. That will open up new options and allow you to keep the subs more in phase with each other. I call shenanigans on your installer, I have MUCH better results running my ULS15MK2 in a nearfield configuration with my VTF15hMK2 up front than I did with both subs up front. Here's a 3d render of how I wound up setting up my subs after many hours of testing my sub positioning and this one wound up sounding the best. If you can, get enough A/V equipment into the space along with your sub, then place the sub in the listening position and do the sub crawl like I did for my basement TV/theater space (before drywall). I used the Hsu bass test CD for this. My main listening position will be between 9'-6" and 10'-0" from the front wall and I wound up finding two really good spots where everything below 80 Hz sounded really good while being on the bare concrete floor. It was easy finding the "boomy" spots near the corners, so I moved away from the corner until the "boominess" disappeared but the bass was still strong. Thankfully, I didn't get great response away from the walls. However, I did find a quasi-near-field location (out 5' or so from the front left corner, so fairly near where the sofa will be) and the other sub near the back of the 13' wide by 24' long room (out 5' or so from the back right corner). With those two positions (out from opposite corners), I'll be able to use outlets on either side of the sub and get sub cables that allow for some flexibility in final subwoofer locations once the room has floor coverings and furniture in place. Remember that the installer works for you and that you have final say in your project. If you can, do the sub crawl--it will be time well spent. I'll follow up with how our room turned out once it is done (late June/early July).